Mithlesh Kumar Chaudhari received his Master Degree in English Literature in 2007 from the University of Allahabad. He cleared U.G.C. NET twice in English literature and he obtained his Ph.D. degree in English Literature in 2014 from the University of Allahabad. 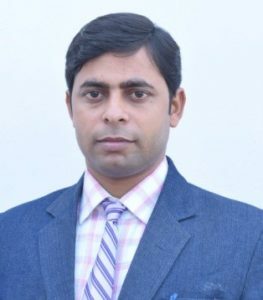 At present he is an Assistant Professor in the Department of English, Jawaher Lal Nehru Smarak Post Graduate College, Maharajganj, Uttar Pradesh. He teaches various professional courses, including English as a Second Language (ESL), English for Specific Purposes (ESP) and Remedial English to graduate students. His research interests include mainly the area of contemporary Indian English drama and literary theory. His research articles and poems have been published in various International and National Journals of repute. He interests writing poetry in English and Hindi as well. His published works include book chapters, research articles, poems in reputed journals and a book recently. Besides his various research articles on gender, literature and language, his poems have been published in journals like Muse India, The Literary Herald, The Criterion, and The Asian Signature. As a thinker and scholar, he has keen interests in Contemporary Indian English drama, Contemporary Literary Theory, Creative Writing, and Eco-Literature. He has been selected as one of the Coordinators of FSLE-India for its Uttar Pradesh East Region.